It is time to let go of what no longer serves you or your mission and purpose. Sometimes this can seem overwhelming or confusing as it can be hard to understand what is holding you in stasis. This is an ideal time then for you to sit quietly and connect with my light and ask for me to help you clear away the thoughts and feelings that are confusing and cut the cords that bind you to lower energy, people and things. Then, take some time and write down everything that you would like to release right now. Take the time to do a thorough job and you will feel so much better and brighter. When you are done and you feel your list is complete, place it in a fire proof container and burn the paper. As it is burning ask that you are cleansed by spiritual fire and let it flow all around you and through you, taking with it all that no longer serving you or your growth. As you are cleansed, and the paper burns, you will feel a release and perhaps even a vibration as it flows away. When you are done, ask to be encircled in a orb of light to seal in this clean new you. Oftentimes lightworkers pick up the energy of others and so is important for you to cleanse and release old energy especially when you are in particularly toxic time. Clear your energy and use light for protection when you feel you need it and enjoy your steps on you path of enlightenment. Communicate your visions and speak your mind with confidence. Keep your focus and be open to creative ideas and solutions from others right now. Looking at things from a new or different perspective can help you accomplish what is important for you. It is important to be yourself and be the best self you can be, as that is a part of the path of the awakening ones. Right now many of you are experiencing such tremendous shifting in your mental worlds; this is the world of your thoughts, your ideas, the work world, the world of the intellect, the world of justice and truth. There is much to look at and consider as it is an important part of the human journey and what will assist you the most at this time to find the balance and inner peace for yourself at this time and not get caught up in the energy of the mass consciousness. This is providing a challenge for many and it is therefore their greatest time to learn, as even if it doesn’t feel like it, it is offering you the most and greatest benefit. If things seem stale and they sometimes will, or unable to make a choice or decision on what is the next action you should take, it is important to release as you will just get more of the same and in a cycle of unbalanced energy as you try to get your footing. Use the power of your creativity, the power of your mind and the passion of your heart to get things moving once again. For most of you, things are looking up (for most of you reading or hearing this message, not necessarily all of those who are listening). You are finally feeling as if things are beginning to come together and make a bit more sense and find your rhythm. There is much to celebrate and things are going to feel more secure for you. New opportunities are going to start flooding in in the form of ideas, inspirations, offers of new contracts, new educational steps, and or any other area of growth you have been planting your seeds. Gifts of money, time and effort will be rewarded, just keep offering the best of you as it unfolds. There is much to celebrate and wonderful rewards and opportunity coming and it is an exciting time. It is important to remember to think things through in a careful process and while time might be of the essences, it is also important that you feel thoroughly confident in all that you sign and commit to. Make sure it feels right and good to you. You can always ask your angels if this choice brings you closer to your mission and purpose and what the path looks like as you head in that direction. This way you feel more in control of the choices that you make and more confident in it’s’ success. Remember to have fun and enjoy yourself along the way, this is most important. Take this next few weeks and find your base, find your center and create a structure with your environment that fits you. Clean up any unfinished business, revise any plans that need to be revisited and figure out clearly where you want to go. Make an appointment with someone who can offer you a higher vision right now as that can help you sort through what you need or want to keep and what you don’t. Using this time to get your home, your thoughts and your emotions in order for the next phase is a most welcome activity and will help you keep the focus that you need. Trust that the seeds have been well planted and your dreams are indeed coming true, even if at first it feels like they have derailed or not turning out as planned. They are, and soon you will see it, you just might need to sit tight for a time. The opportunities are still coming, and so do not waste any of it on unnecessary worry or crying over what might have been. You are an important part of the team of light beings who are here to make a difference, to make a change and it is time to ignite your passion for life and feel the energy and drive for the next phase, as there is an important part in coming. 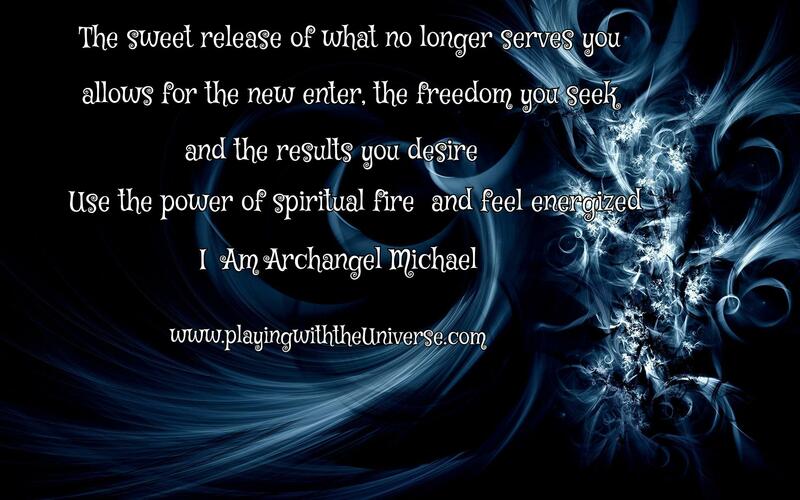 I AM Archangel Michael, and it is my honour to be called upon once again.